An "ethereal" 10 second clip of a woman singing a French folk song has been played for the first time in 150 years. The recording of "Au Clair de la Lune", recorded in 1860, is thought to be the oldest known recorded human voice. A phonograph of Thomas Edison singing a children's song in 1877 was previously thought to be the oldest record. The new "phonautograph", created by etching soot-covered paper, has now been played by US scientists using a "virtual stylus" to read the lines. "When I first heard the recording as you hear it ... it was magical, so ethereal," audio historian David Giovannoni, who found the recording, told AP. "The fact is it's recorded in smoke. The voice is coming out from behind this screen of aural smoke." 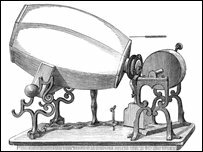 The short song was captured on April 9, 1860 by a phonautograph, a device created by a Parisian inventor, Edouard-Leon Scott de Martinville. The device etched representations of sound waves into paper covered in soot from a burning oil lamp. Lines were scratched into the soot by a needle moved by a diaphragm that responded to sound. The recordings were never intended to be played. It was retrieved from Paris by Mr Giovanni, working with First Sounds, a group of audio historians, recording engineers and sound archivists who aim to make mankind's earliest sound recordings available to all. To retrieve the sounds scientists at the Lawrence Berkeley National Laboratory (LBNL) in California made very high-resolution digital scans of the paper and used a "virtual stylus" to read the scrawls. However, because the phonautograph recordings were made using a hand-cranked device, the speed varied throughout, changing the pitch. "If someone's singing at middle C and the crank speeds up and slows down, the waves change shape and are shifting, Earl Cornell, a scientist at LBNL, told AP. "We had a tuning fork side by side with the recording, so you can correct the sound and speed variations." Previously, the oldest known recorded voice was thought to be Thomas Edison's recording of Mary had a little lamb. The inventor of the light bulb recorded the stanza to test another of his inventions - the phonograph - in 1877. "It doesn't take anything away from Thomas Edison, in my opinion," Mr Giovannoni told Reuters. "But actually, the truth is he was the first person to have recorded [sound] and played it back." The new recording will be presented on 28 March at a conference of the Association for Recorded Sound Collections at Stanford University in California.